Extraordinary stock footage and photography. Over 10,000 clips added weekly. See some of our favorites. Dissolve is a successful and young stock footage agency focused in the high-end of footage industry. They are defined by their premium content from talented and renowned filmmakers, videographers and production studios, that also makes their collection to have a greater cinematic and professional feel. The core of the company is the content that is one of the hottest visual trends since last year: authentic imagery. A significant added value in their offer is their large selection of exclusive footage and free bonus services. Thanks to this concept, in the 3 years they've been in business they have gained a good position in the market and are consistently increasing popularity. For all this and more that you'll find out below, they're one of the 21 Best Stock Footage Websites we know and love. Dissolve is a great option if you are looking for high quality, professionally-shot footage that resonates well with cinema style. Want to explore their offer? Sign up with Dissolve now! But if you want to learn more about this agency, keep reading! Ready to explore Dissolve? Head over to their website and start browsing! If you want to buy footage, sign up at Dissolve now! The company's focus is on the high-end of the industry's spectrum. They work with top-of-their-class contributors (filmmakers, videographers, video and film production studios, etc. ), and they aim at serious, highly demanding buyers. They want to serve creatives and companies who are looking for premium, top-notch content, and who are time-sensitive. These premises shape up their offer in terms of content and services. They have high quality standards for the footage they sell, in every resolution, topic and style. But more importantly it revolves around the concept of authenticity that is so popular in visual trends right now. They have professional and beautifully shot videos that depict natural-looking scenes, candid performances, and modern perspectives on varied concepts, using simple, yet powerful, techniques. And they have something that not all agencies have: exclusive content. Dissolve has built a large collection of footage that can only be found at their library. Royalty Free licenses mean a lot of different customers can license the same clip, but they also offer Rights Managed licenses that let you get the exclusive usage right for a video too. Again, something you won't find at all agencies. 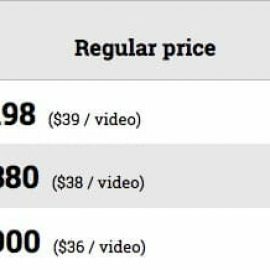 Their buying system is a la carte only, and their prices are varied; for non-exclusive, Royalty Free HD clips they have a better price than the competition, at $29, but the rest of their price points are a about $100 higher than at other outlets. Of course, this comes with the added value of premium content and exclusive clips. While they don't have video packs nor subscriptions, they do give you discounts when you make large purchases. The more money you spend, the greater the price cut. However, you have to spend as much as $1000 to get the minimum discount. An important highlight is their free bonus services. Always thinking in busy buyers who have no time to search for content, they have a free in-house research service for all customers. And they add a priority treatment option to get first spots in queues and other extra benefits suitable for big production studios. Do you like how that sounds? Then go ahead and visit Dissolve to have a look yourself! Dissolve's primary offer is footage that is ready to be used in all kinds of commercial or for-profit purposes. Their Commercialy-licensable videos are model and property released, ensuring they are perfectly legal to be used in commercial projects. But they also have a selection of Editorial footage. In this case, the videos depict people and places for which there is no release document signed, and so they cannot be used commercially. Editorial footage can be used to enrich informative, educational or other editorial-related content, but never for profit. This is one of the most distinctive points in Dissolve's model. Not many stock footage agencies have exclusive content. They do. From their collection of over 1.1 Million clips, over 150,000 of them are exclusive. This means you will not find those clips anywhere else. Some are exclusive videos from contributors who also sell other clips at different agencies, but some are from contributors who only do stock forDissolve, meaning you will not find clips from those authors outside this agency. The value in exclusive clips is that being distributed at one channel, they are much less used in general, and that helps give them a greater sense of uniqueness when you use them in your own content. Having people recognizing scenes from your video as something they've seen in a commercial or a movie undermines your work's originality, and exclusive clips can help avoid that. However, when using Royalty Free license there is no way to stop other users from buying the same clips and use them in similar ways. Exclusive footage reduces the risk, but doesn't eliminate it. Dissolve has a much better option: Rights Managed license, that lets you buy the rights to be the exclusive user of a certain video for a determined period of time. Bear in mind, though, that this doesn't come at little cost: exclusivity buy-out can be very expensive, although in certain cases it definitely worths the price. The vast majority of their library is non-exclusive, though, and comes at lower prices than exclusive while keeping the high quality, premium standards and aesthetics. Liftoff is a service they have for big, renowned contributors. Filmmakers, videographers, production studios and companies who have a lot of great spare content, but no time to submit it to Dissolve. For them, the company reviews, selects, edits and keywords the best shots, and puts them up at their library, on behalf of the contributors, whom sell exclusively with this agency. Most of these contributors are professionals from the film and cinema industry. Their content is superior, and has a higher cinematic aesthetics, as well as a greater production value. The Liftoff collection includes all these clips, that are exclusive to Dissolve and stand out within the rest for bringing more remarkably the cinematographer's eye to stock footage. If you are filmmaker looking for extra scenes and b-roll for your production, this collection is a great fit for your needs. These are the two licensing models the agency works with. 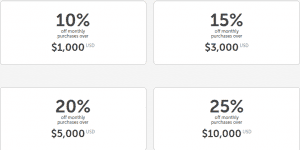 Royalty Free is a simple and quick way to buy stock footage. You pay a flat, one-time fee, and you get a set of rights over the footage that covers a wide variety of uses. You can use the content forever in any of the accepted ways, for as many times as you like, without having to pay a single penny extra. For this reason, RF license tends to be much cheaper than Rights Managed. RF has some limitations: you are not allowed to use the footage in content with intentions to resale, and you can't let more than 10 people access and work on the licensed content. To get these rights, you must buy an Extended license, at extra cost. 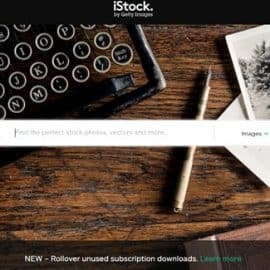 Extended lets you use stock footage in software templates and other resale products, as well as to have unlimited users access to the downloaded file. In the case of Editorial footage, it only adds unlimited users access. Rights Managed is a more advanced license that at times offers you more than RF does. This licensing type's price varies, as it's determined by the medium, purpose, geographic placement, distribution volume, among other parameters. Plus the license covers only the consigned use. If you want to use the same content in any different way, modifying even just one of the terms, you need a new license. The greatest advantage in RM is that it lets you buy the right to exclusively use a stock video for a certain period of time. Moreover, you can get the history of usage (they ways in which the same clip was used before). This can help you not only assure you are the only one using that footage, but also that you are using it in an original, never before seen way. Learn more about Dissolve's licenses here. See Dissolve's full pricing here. Althought the discounts are good, the problem is you only get them after spending a considerable amount. Given that clips are priced differently, the chance to seize these discounts depends solely on what kind of clips you want to buy. If you only need non-exclusive HD footage, you would have to buy as much as 35 videos just to get the minimum discount, while if you are looking for exclusive 4K content you would reach the 10% off by buying just 2 clips. Plus, the system accumulates your purchases monthly, so when the month finishes, your count goes back to 0 dollars spent. The discounts are a nice deal, but only for large volume buyers with a considerable budget. While being centred in stock footage, last year the agency added stock photography as a complement. The stock photo collection is built under the same company premises: it's all premium content, prevailing authentic feel and natural style, sourced by the most renowned photographers and photography studios and brands. You can buy stock photos a la carte, and they are priced by size, from $49 for an XS (600px) image and up to $499 for an XL original file. One of the things you will notice when you visit Dissolve's website, is how modern it looks. 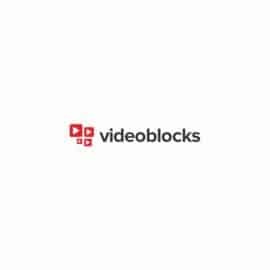 They have an edgy design and their homepage lets you discover their most revelant content, with editor's pick for footage and photos, and labels for each media type. Their library is neatly organized, with categories, themes and styles. And it's highly-searchable with a user-friendly search tool that lets you use keywords and filters to find exactly what you're looking for. Plus, they develop many creative and artistic projects to showcase the different ways in which you can use their footage. The showreels section is full of inspiring, intelligent, compelling and funny videos created using assets from their collection. In fact, some of these productions have gone viral, got recognition and have even been awarded by creative industry organizations! Their blog is also very interesting, as they share tutorials, contributor profiles and other related content, besides company news. All in all, Dissolve's site offers a lot of resources to inspire and improve your creations. This is a big plus in this agency. As they aim at big, serious buyers, they know often times these customers won't have the time to browse the site, perform searches or wait for services. So they have added assistance solutions for all their members… for free! Despite having a good search engine for you to seach the clips you want, they offer free research: you tell the in-house researchers the general lines of what you are looking for, and they search, refine and deliver you the best matching results. And yes, this is totally free and available for everyone. You can enter your search parameters in a dedicated page on their site, and they send you results via email. To view the results you need to sign up at the agency, but this, again, is free. For big, busy studios and companies, they also have a priority service, that you can sign up for at no extra cost. Being a Priority customer you get the first spot at the free research queue, team accounts to give access to more users to your account, unwatermarked full-size files for your comps, and a monthly billing system (you download all the assets you want instantly, and they bill you for them once a month). Having these solutions at your reach without having to pay extra for them can be a big advantage to save time and get better final results. Considering all the detailed above, we believe Dissolve is a very good choice for buying stock footage. Althought their price points can at times be higher than at other outlets, the addition of exclusive content and bonus services makes it worthwhile. The content they sell is the kind of content that end consumers are preferring lately, and so choosing that style is a smart choice if you want to assure a good response from an audience. The company is backed by industry experts with impressive backgrounds, which adds a trustworthy label to them. However there's one important condition to the suitability of this agency for you: your profile. If you are a small individual creative, who only buys a clip every now and then, Dissolve's fitting in your needs will depend on many factors. The superior content they offer and the free research could be worth exploring, but if you have a tight budget, the exclusive collections and the best resolutions might be out of your reach. And there's no way to get price cuts unless you spend at least $1000. But if you have multiple projects going on at the same time, if you lead or are part of a creative team or a studio, or if you simply have a looser budget for stock footage, then Dissolve is one of the best options you'll find. If you don't mind paying a bit extra, you can benefit from their unique footage. And their bonus services can be a breeze of fresh air in your workflow, saving you time and effort and not costing you any extra money. Are you ready to explore Dissolve? Sign up and start buying premium footage now!